It's been a big few weeks for the Two Birds team. Founders Dani and Jayne travelled to the UK to brew a real ale version of their Sunset at Everards, returned to discover they'd retained their Champion Large Brewery title at the Craft Beer Awards and then found out their Sunset Ale had taken the Champion Beer at the Wetherspoon's festival in the UK, following in the footsteps of its sibling, Golden Ale. Yet they've still found time to continue with their collaborative ventures with their favourite venues across the country. One of the most recent to visit their Nest in Spotswood was Manly's New Brighton Hotel (home of the 33 Degrees craft beer bar). 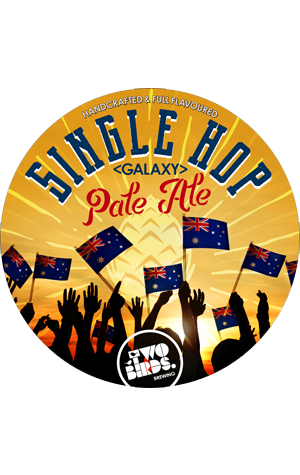 Together they decided to brew a beer that should be ideal for a spot of quaffing while looking out over the beach: a tropical, Galaxy hopped pale ale. We're told the staff from the bar wanted "the ultimate Summer Session Beer"; they'll discover whether they did when it's launched on November 6.